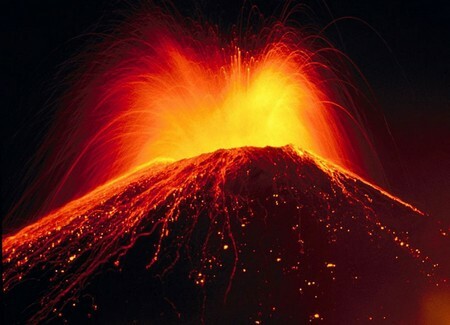 It is unusually boring to learn about the different features of a volcano through a book. How about building one at home? From the outside, the whole process of building a volcano might seem to be quite intricate. However, in reality the process is not only easy, but also very interesting. Here is a step by step procedure to build a volcano. 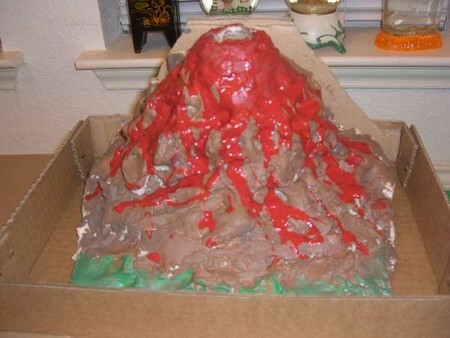 Materials needed for building a volcano are flour, salt, cooking oil, baking soda, vinegar, dishwasher detergent, red color and water. A baking dish and 2L plastic bottle are also required. Start with the mountain first. For this, 8 cups of flour, 3 cups of salt, 5 tablespoons of cooking oil and 3 cups of water would be needed. Mix all the ingredients, and continue to stir the mixture until smooth, but firm dough is formed. If the dough appears to be thin in consistency, then add some flour. Set aside the mixture for a few minutes to allow it to harden. Take the baking dish and keep the bottle in the upright position in the center of the dish. Start sculpting the mountain around the bottle. Take care not to close the top of the bottle. Also the dough shouldn’t get inside the bottle. Try to make the mountain as real as possible. The cracks, crevices, fissures, slopes and gaps should all be there. In the next step, heat the water to fill about three quarters of the bottle. Don’t boil the water, just heat it. Pour the warm water into the bottle, and thereafter add the red color. This should be done quickly because the volcano explodes better when the water is still warm. While the water is still warm, add 6 to 7 drops of dishwasher detergent. This will serve to produce foam that bears resemblance to the steam and gases of real volcano. Next add 3 tablespoons of baking soda. Lastly, add vinegar into the bottle. The reaction between baking soda and vinegar will cause an explosion to occur. The volcano will erupt and lava will start oozing out of its mouth. Due to the reaction, carbon dioxide will also be emitted. No other harmful gases will be produced. As a mark of precaution, all the ingredients should be added as quickly as possible and the entire process should be performed only under adult supervision. Even a small bit of carelessness can produce deleterious effects.